Good news to all job hunters! 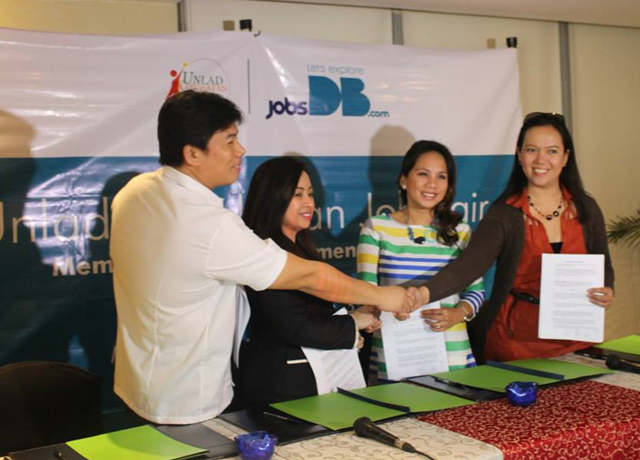 I got invited to the signing of the Memorandum of Agreement (MOA) between Jobsdb and Unlad Kabuhayan yesterday, November 21, 2013, held at Discovery Suites in Ortigas Center, Pasig City. Jobsdb and Unlad Kabuhayan will organize a job fair dubbed "Unlad Kabuhayan" scheduled on January 24 to 26, 2014 at the SMX Convention Center, Mall of Asia Grounds, Pasay City. The Unlad Kabuhayan Job Fair will feature more than 200 exhibitors representing companies belonging to different sectors, and the event is expected to be attended by more than 80,000 participants. The program will also include a career convention that will feature notable speakers and career-guide experts who will be announced later on. Please mark your calendar(s) and be sure to attend the Unlad Kabuhayan Job Fair. NOTE: The above logos belong to jobsdb.com and unladkabuhayan.com, respectively. ha ha ha! Madami nakaka miss kay GMA dahil sa holiday Chyng!